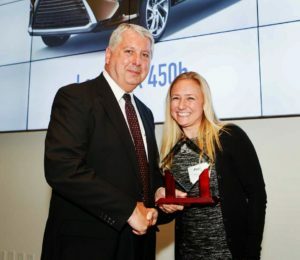 Cambridge, Mass., May 25, 2017 — At its annual awards dinner, held at the MIT Media Lab, the New England Motor Press Association honored four individuals for their outstanding contributions to the automotive industry and awarded trophies for their annual NEMPA Winter Vehicle, Ragtop and Automotive Excellence Awards. Herb Chambers is the President of the Herb Chambers Companies. In 1985, Herb purchased a new Cadillac in New London, Connecticut and became so frustrated at the way he was treated that within an hour he purchased not only the Cadillac, but bought the dealership, too. At that time, there were 31,000 automobile dealers in the United States and Herb became number 31,001. The acquisition of several other dealerships followed soon thereafter. Today the Herb Chambers Companies are comprised of fifty-six automobile dealerships representing thirty-five different franchises in Massachusetts and Rhode Island. They are the largest automobile dealership group in the Northeast and the sixth largest privately held automobile company in America. Last year, their sales were in excess of $2.6-billion dollars and they have over 2,500 employees. In 2015, the Herb Chambers Companies delivered 56,000 vehicles. In 2003, Herb Chambers was named Ward’s Dealer of the Year out of 22,500 dealerships in the country. His company has earned more J.D. 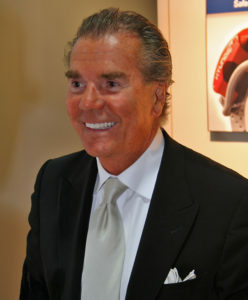 Power Certified Retailer Awards than any other automobile dealership in North America and he was named the Massachusetts Automobile Dealer of the Year for 2008. The Herb Chambers Companies has been voted one of the best places to work for in Massachusetts every year from 2009 – 2016. The Herb Chambers Companies is the first automobile dealership group to ever make this list. Herb has always been a car enthusiast at heart and has now spent 30-years in the automotive industry. He continues to grow The Herb Chambers Companies and is expecting to acquire three additional dealerships in 2017. NEMPA members honored him with the award for many reasons that make The Herb Chambers Companies and employees successful. The Herb Chambers Companies stand out in selling style, commitment to customer service, and brand management strategy. NEMPA members also recognized that he is a very dedicated and caring leader with a tireless work ethic and entrepreneurial spirit. He also takes the time to passionately share his knowledge and experience with others. 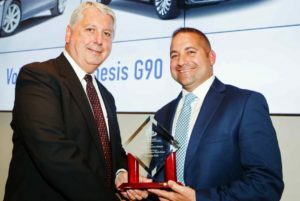 The New England Motor Press has named Alan Bethke Marketer of the Year for the continued success of the Subaru “Love” campaign that has had a tremendous impact on the incredible sales success story the brand is enjoying. Alan has been instrumental in defining and stewarding Subaru’s highly successful “Love” campaign, including developing strategy and award-winning advertising creative. During Alan’s tenure, Subaru has refined the Subaru brand, successfully launched new models, and reached record levels of brand and product awareness, favorable opinion, shopping, and customer leads. Since 2007, Subaru has tripled its U.S. market share, with eight consecutive annual sales records, and record profits with the lowest customer incentives in the automotive industry. Alan Bethke is Senior Vice President, Marketing at Subaru of America and has overall responsibility and accountability for Subaru’s marketing department, including brand strategy, model strategy, new product launches, media planning and buying, digital/mobile/social marketing, advertising creative, lead management, sponsorships and promotions, regional and dealer marketing, and customer advocacy and retention. NEMPA presented P. J. O’Rourke this award for being an individual who has emulated the enterprise, collegiality, helpfulness, integrity and good will that marked the career of Charlie Dole, for many years the automotive columnist for The Christian Science Monitor and dean of the New England automotive press corps. 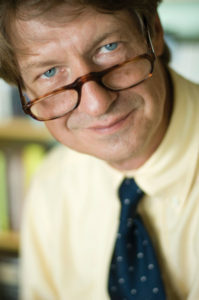 J. O’Rourkehas written nineteen books on subjects as diverse as politics and cars and etiquette and economics. Parliament of Whoresand Give War a Chance- both reached #1 on the New York Times bestseller list. His most recent book is How the Hell Did This Happen? : Election of 2016. He is a contributing editor at the Weekly Standard, H. L. Mencken Research Fellow at the Cato Institute, a regular panelist on NPR’s Wait Wait… Don’t Tell Me, and a columnist for The Stansberry Digest investment letter. He lives in rural New England, as far away from the things he writes about as he can get. 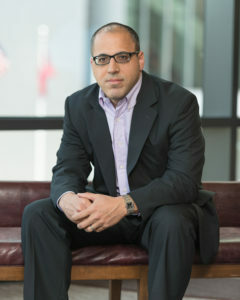 Steven Oldham is the Northeast Public Relations Manager for Nissan North America. 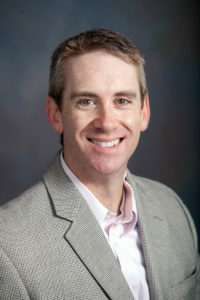 Steven became Northeast public relations manager in July 2005. In this role, he leads all communications efforts for the company in the Northeast and Mid-Atlantic regions. Specific responsibilities include all media relations for both product and corporate communications from Boston to Washington, DC. Oldham has nearly 20 years experience in the automotive industry. He started his career out of college in 1997 at Fred Mackerodt, Inc. where he was responsible for pick-up and delivery of General Motors press vehicles on the East Coast. A year later, he moved on to A&M Specialists in NJ where he was in charge of various automotive press fleets that included Mitsubishi, Hummer, VW, Audi and Jaguar. In 1999, Oldham went on to work for Mike Geylin at Kermish-Geylin Public Relations where he was in charge of national Porsche major media programs, Exide batteries communications among others. Oldham holds a Bachelor of Arts in communications from Rider University in Lawrenceville, NJ. 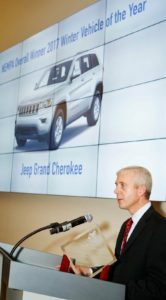 Accepting the 2017 NEMPA Overall Winner of the Winter Vehicle of New England Award was Scott Tallon of Jeep for the Jeep Grand Cherokee Trailhawk. In this hotly contested race it was close between the Jaguar F-PACE and Jeep’s own Cherokee. The Grand Cherokee was selected by NEMPA members due to its ability to go anywhere, selection of engine choices and a “just-right” size. The Grand Cherokee is no stranger to winning the coveted NEMPA winter vehicle award having won several times in the past five years. The all-new Golf Alltrack won the category overwhelmingly with its general appeal, maneuverability and a first class Volkswagen interior. Making another return visit to the podium is the Dodge Charger, a fun four-door all-wheel drive sedan with hulking good looks and plenty of features NEMPA members liked. These included a user-friendly touch-screen, full complement of safety features, and, for those who desire it, a 707-horsepower Hellcat edition. The ever-popular Subaru Outback continues to shine as a great all-wheel drive vehicle. Due to its popularity in the Northeast, some refer to the Outback as the official state-bird of New England. Unquestionably, it’s a solid, comfortable, reliable winter-ready wagon that won’t break the bank. NEMPA members like the A4 allroad’s sportscar-like handling, ability to go anywhere including off-road, and an interior that is a standard by which other cars are judged. Legendary safety with stylish good looks and a premium quality interior are some of this big Volvo’s strong points. NEMPA President, John Paul presenting the award to Alex Nunez accepting on behalf of Genesis. This G90 is a new entry to the luxury car category and checks off every box including all-wheel drive. It’s easy to see why this big Genesis was a hit with NEMPA members. The Cherokee Trailhawk was able to conquer everything that this past winter was able to throw at it. NEMPA members had confidence behind the wheel of the Trailhawk both on- and off-road, many thinking it was the perfect all around vehicle for New England. Mazda managed to put “Zoom-Zoom” in this midsized SUV while blurring the line between affordable and luxury competitors. Nissan landed in just the right spot with the Armada offering rugged good looks, power to tow up to 8,500 pounds and seating for seven – all in a package that’s large but not too big. 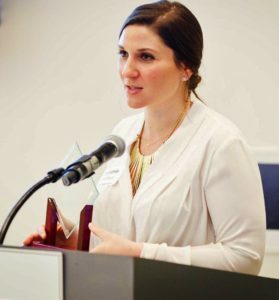 Stephanie Wellings from Jaguar Land Rover North America LLC accepting on behalf of Jaguar. It’s a Jaguar and a SUV. Years ago the idea that Jaguar would build an SUV was considered blasphemous, but in today’s marketplace, Jaguar was able to pull it off. The F-PACE speaks volumes about how with its great handling, sophisticated interior and stylish good looks. Plush ride, powerful engine, plenty of tech, and comfortable seating, put the Infiniti QX60 at the top of the mid-size luxury SUV/Crossover category. The Range Rover is a perennial favorite with NEMPA members and for good reason. Premium style, gasoline and diesel engine choices, and notable fuel efficiency, make the Land Rover Range Rover a winner. Plus, with the Land Rover Terrain Response system providing superior on- and off-road performance, drivers sit up high, survey the world around them, and enjoy all the comfort and dependability that this Range Rover has to offer. The Ridgeline was described by many as the “Swiss Army Knife” of pickup trucks. It can tow, has great storage, novel features and Honda’s legendary reliability. This is the first time a non-all-wheel drive vehicle has won this category. NEMPA members loved the versatility, seating comfort and technology — for families no more, “Are we there yet?”. The Lexus RX 450h manages to hold its luxury head high while being kind to the environment. Powerful and fuel efficient, it’s able to reach 60 miles per hour in seven seconds, while still getting 30 miles per gallon. That is impressive for any SUV and this Lexus does it with style. 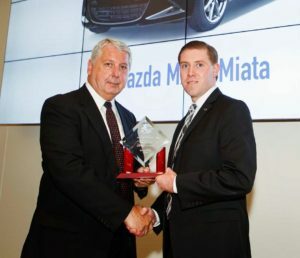 NEMPA President, John Paul presents the award for Best Value Convertible for the Mazda Miata to Mazda’s Mitchell Harris. Head out on a nice summer night or on a trip to the beach and you’ll understand why the Miata just feels right. There are those who don’t like change and the new Miata has changed – but in the words of NEMPA members, the latest Miata may be the best to date. The SLC300 puts a priority on year-round comfort, a quality interior and stylish good looks. The athletic 2-liter turbocharged engine is frosting on the cake. The stylish Jaguar F-TYPE convertible provides a wealth of reasons to be recognized with this award starting with its smooth and powerful engines that make no apologies for their mellifluous muscle car exhaust notes. Add in the idea that buyers can opt for a true manual transmission and all-wheel drive and it’s easy to see how the F-TYPE seduced NEMPA members. 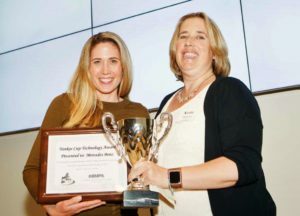 Mercedes-Benz USA accepts the NEMPA Yankee Cup Technology Award from NEMPA Vice President, Nicole Wakelin. WheelsTV in association with the New England Motor Press Association presents The POV of the Year that singles out a pre-owned vehicle that has been in service for at least two years and demonstrates outstanding long-term reliability as well as exceptional consumer satisfaction. The 2017 WheelsTV POV of the Year Award was given to the 2012 to 2015 Honda CR-V. The Honda CR-V has defined the essence of the compact crossover category with its competent performance, comfortable ride and versatile interior. 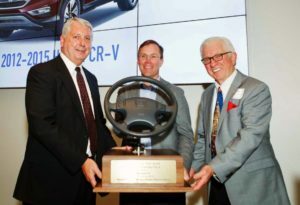 But what distinguishes the fourth generation CR-V from its peers, and drew the attention of the POV of the Year panel of judges, is how well it fit the established criteria for receiving the award.